I had lunch with a atheist! And while he was challenging my faith, I realised that a new or shallow believer would be easily swayed by his arguments! How can a God who is omni-benevolent allow evil? How can a powerful God allow evil? And it amazes me how much he knew about the bible, and yet he chooses not to believe. Well, I know that some of the arguments are taken out of context, but I couldn't present my arguments coherently. But despite his challenges, I still believe and have faith in God. Just that I felt kinda disappointed in myself not being able to counter some of the arguments. One interesting concept he introduced is the Pascal's Wager: Either God is; or He is not. Should man believe - given that man's finite wisdom and reason cannot prove the existence or non-existence of God. Pascal said that given these circumstances, a rational person would choose to believe. If he believes, and God exists, he gains eternal life. But if God does not exist, he gains and loses nothing. If he chooses not to believe and God does not exist, he gains and loses nothing. However, if God exists, he stands to lose everything from eternal condemnation in hell. Well, interesting concept but I don't think I want to use it to preach the word. Believing in God is to know that he died for my sins, loves me and has a plan for me in life. I choose to believe. Not coz I was cornered or reasoned into believing. And I place my faith in God because I know in my heart that He lives. But it was interesting to hear the Pascal's Wager. I wonder how many people believe cause of it and how their relationship with God would be. Enough of these abstract philosophy. If I had enough money to throw, I would make me a suit jacket with a shoulder that is peaked! No more sloping shoulders. Makes a man look much smarter ya? 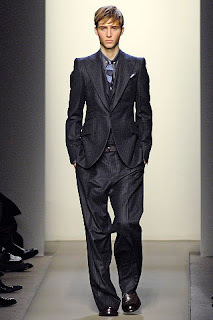 Even when paired with full and baggy pants - he still looks smart as long as the jacket's trim and tailored. So, one of the things I need while staying at the Hilton when I'm in the States is a laptop! (Hilton for 6 weeks, I'm going to be soooo broke after that) Shirley is so kind as to lend me her old MacBook, coz as all you Mac users know, once you gone on the Mac, you can never look at Windows again. So I was looking through her collection of photos and I found pictures that I've forgotten - including the Baptism of my Goddaughter! I am such a bad Godfather.. 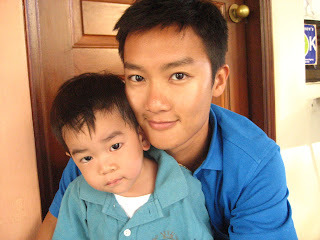 I'll share the pics of the 2 cute-as-a-button-kids in church. Gwyn Ow (aka my Goddaughter) and Thaddaeus John Tham - who already has a blog, link is 'Thamlet' under the 'People' section of my blog. Before I go, I just saw the most beautiful bag! 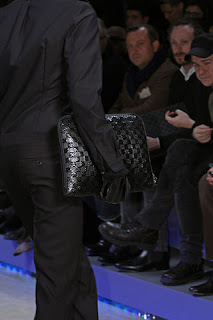 It's from the Louis Vuitton Fall 2008 collection. Black painted Daimer canvas, subtle yet recognisable to those in the know. Great for carrying my documents and perhaps the MacBook Air? Some of the fantastic people I shared my trip with! The Stung Meanchey dumpsite left a deep impression on me. It was a wake up call that an ASEAN neighbour still has such places. Children run barefoot on rubbish, picking through scraps in hope of finding something of value to sell. I went to Cambodia expecting nothing. But strangely, I gained a lot. I had a new found joy to spread God's love. Be it through songs with kids, teaching them to brush their teeth, distributing food or even acting in a skit. Whoever said that Japan is an expensive country is grossly misinformed. HL just told me that the Canon IXUS 860 I'm eyeing retails for 32,000yen about SGD$400. In Harvey Norman, it's $669. $600 if I buy it in Sim Lim. Still cannot match Japan. Then Ying and Keli just came back from Japan and said that a bag in Agnes b that costs $400 here would be half that in Japan Agnes b. Woah! I'm so going Japan this year... HL watch out! Recently bought an iMac. It's gorgeous! I'm a convert. It's like how people discover a really cool restaurant or brand and want to tell all their friends about it? I wanna stand on top of a mountain and preach the goodness of switching to a Mac!! So, why spend $2048 on a Mac if I am not going to fully utilise its features? So I volunteered to do the video presentation for the Cambodia Mission Trip I went to in December. Many many hours later and $55 poorer (from buying Quicktime Pro), I've come up with the video. So wanna know what I did in Cambodia? Watch and enjoy. Finally got to doing this. Blogging. Keep coming back for more postings!